Car-sharing, ride-sharing, lift-sharing in Singapore: So you travel to and fro work daily, taking the same driving route, bus or MRT route (for the lucky few, cycle or walk). Now how do you get to your workplace without getting too frazzled or squeezing with the crowd in public transport? Carpooling offers commuters a more direct, more comfortable, and more time-efficient way to commute to work. For owners of vehicles, ridesharing or carpooling, allows them to recover some of the journey cost to pay for petrol and road toll. Not only do you get to know your neighbours better, you get a few more supper ‘ka-kis’ (friends)! Through new technology such as mobile app and website, passengers looking for a ride and drivers offering rides can be aggregated into shared transport. If there are alot more passengers than drivers, buses can be chartered (“Bus-pooling”). Lompang is a carpooling app that pairs you with nearby commuters. Simply type in your start and end addresses, and we will get back to you when we have a potential match. No need for any personally identifiable information whatsoever. In fact we don’t even require a login. Just download the app and in 30 secs, you should be able to post your route! You can exchange contact details via the chat messenger when you and the other party are interested and willing to use credits to make contact. Download Lompang App from iOS Appstore and start saving money on your transportation now! Sharetransport.sg started in March 2012, takes the problem of Singapore transport situation into its own hands. The website and iOS app aggregate people who live in the same estate and work in the same place into shared transport by car-pooling, taxi-pooling or bus-pooling. Currently, the platform is the latest and most prominent with 15,000 users and expects to exceed 20,000 next year. The platform goal for vehicle owners is that their first trip out of the estate in the morning is to send their neighbours to work. 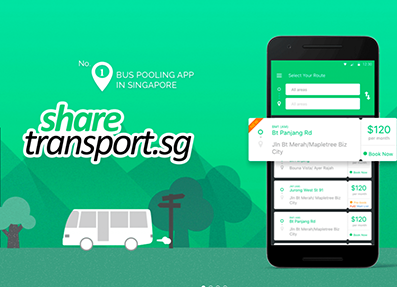 Sharetransport.sg is one of the 3 social initiatives started by local software house Estatebuzz.com, which includes Blockpooling.sg and Microfranchise.sg. Carpoolking.com started in 2007 by 32-year-old New Zealand-based Taiwanese who runs a software business in China, hosts Carpool King. This car pool platform helps to match carpool and goo in Singapore. Carpool King has more than 15,000 users registered in the region, of which 5,000 are in Singapore. Car pool needed from Bishan/Marymount/Ang mo ki to NTU . Any one? Need carpool Woodlands to tiong bahru area Mon to Fri 5.30 pm from September onwards. Pls apps me at 83339591. Thks ! Provide carpool service from Outram Park to Tampines at weekdays in the mornirng at 8am, back at 6pm. Looking at carpool one way. From Serangoon North to SGH area. Please leave a message @ 81813832 if there is a match. Thanks! Hi, I am looking for to and fro carpooling from July 11th onwards. Need a regular ride on weekdays, reach destination i.e. Changi Prison by 8:00am – 8:15am from Toa Payoh postal code: 310163. Return from Changi prison to Toa Payoh at around 5:15 to 5:30 pm. Please send me a message @ 97713608. Bedok North Orchard / Tiong Bahru / River Valley; Mon.~Fri. from/to Bedok 8am/630pm; please let me know if you want to share a ride/cab etc. thanks. I provide car pool service. Msg me at 82905555 for more details. Hi, I am looking for carpooling from June onward. Need a regular ride every weekday, reach destination 438 Alexandra Technopark by 8:30am – 8:45am. From postal code: 520815, ideal pick up point – bus stop at Opp St Hilda’s Primary School or any bus stop around the area, destination will be 438 Alexandra Technopark (119958). Please send me a message @ 98348185. Hi, need a regular ride every weekday from Woodlands to Marina Bay Sands for me from 5:30am to 6:00am, sms me at 97709567. Thanks. Need a regular ride every weekday from Tanjong Rhu to Raffles Place for me and my gf to reach by 830 AM to 9 AM. Looking for carpooling from April onward. Ideal pick up point – bus stop at Opp Telok Blangah MRT or Harborfront MRT bus stop , destination will be Vertex 33 Ubi Ave 3. Fares to be discussed further. Looking for transport from punggol waterway brooks to seRangoon or metropolis? Any pooling from Tuas South to nearby MRT stations at after office hours? Any pooling from Sengkang to Tuas? CARPOOL FROM BUKIT PANJANG TO TUAS. If you have any friends/relatives/staffs working at TUAS AVE 1 to 20 area and wish to take carpool every morning to work, you may contact me at my mobile 9699-5394. One way trip in the morning. Monday to Friday. Pick up timing around 7.15am to 7.30am. Price neg as it depend on your pick up location and your work place. I provide limousine service n Regular Services, per trip 25.00 (any place). Airport to Hotel – $35.00. Hotel to Airport – $35.00. Hotel to Zoo, Jurong Bird Park, Sentosa (Casino, Hotel) – $35.00. Family Outing (chalets) per hour 35.00. This is not car pooling service. Thanks . 91693789 (Hp) Mr Tay. Thanks. HI, I provide Car pool Service price is reasonable. (max 4 person). 20 to 40 dollar (depend on the location) per person. Looking for transport to travel from punggol waterway terraces 2 to chongzheng primary. To reach chongzheng primary before 0720 am. 1 adult 2 child. Leaving Admiralty MRT at 6.30am, passby Sembawang MRT and Yishun, Tampines, Changi City Point and reached Changi Naval Base at 7.40am. Leaving Changi Naval Base after work around 4.45 to 5pm. Whatsapp me @ 93366397 for more details. We are a small IT start-up that provides a matching service for Carpoolers. Our website is at http://www.RideWithMe.sg and we would greatly appreciate if you could give us a try and let us know what you think. Lyft2go is the best dynamic carpool solution of Singapore, It connects people to share empty seats in your car by a click any day, anywhere and anytime. – Chk http://www.lyft2go.com Launching soon!